We are happy to report that framers have completed most rough-framing at Bridge House. February weather was “brutal”. Now that windows are installed and with even colder weather coming, it’s time to focus on inside work. Indeed, the upcoming week’s forecast says highs in the low-teens. Let the craft rough-ins commence! See the latest project progress photos in the project page here! One of our favorite publishers called this week, and will feature a story about modern lakehouse, “Esther” that they’ll release in April. Concurrently, we had been planning a late winter trip to gather missing key shots. Equally important, we want to finish our own story about the project. Happily, we were able to get the missing information and share with the editors. This was our second official collaboration with this most talented client – and we hope not the last! Please check-back in late March, as we’ll plan to highlight the story at release! 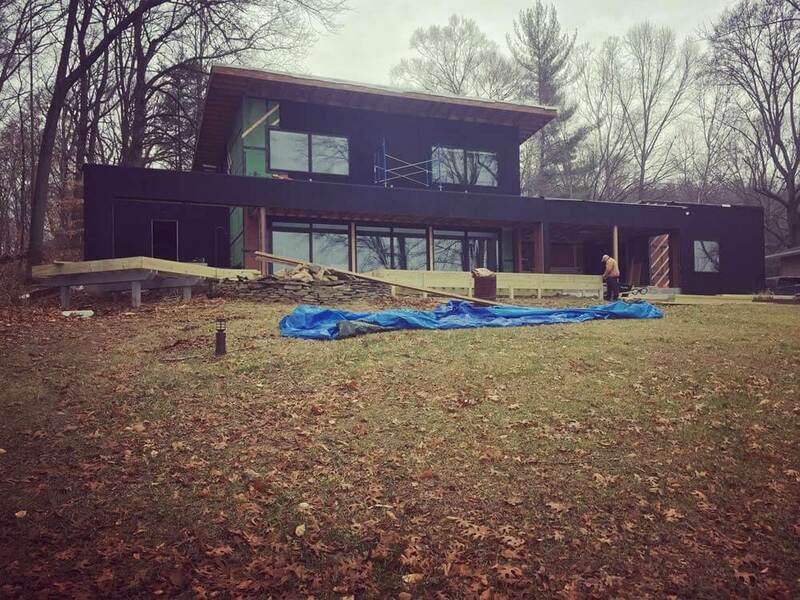 Lakeside Modern Cottage at Lake Lemon is nearing completion and will be ready for 2019 boating season! Without doubt, we are grateful to our clients for the chance to collaborate with them on comprehensive architectural design, interior design, and construction management (CM via WERK | Building Modern). As a result, this project is realizing the full benefits of direct, daily communication between Architect, Trade Contractors, and Client. Most certainly, this comprehensive project leadership ensures design + construction alignment, including evaluation of design opportunities and alternatives along the way! 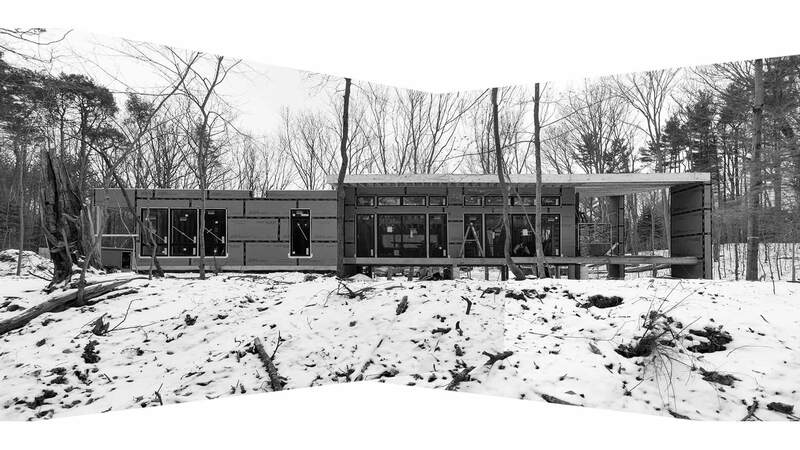 At last, we are excited to report that the new minimalist modern house at Indian Head Park is substantially complete! 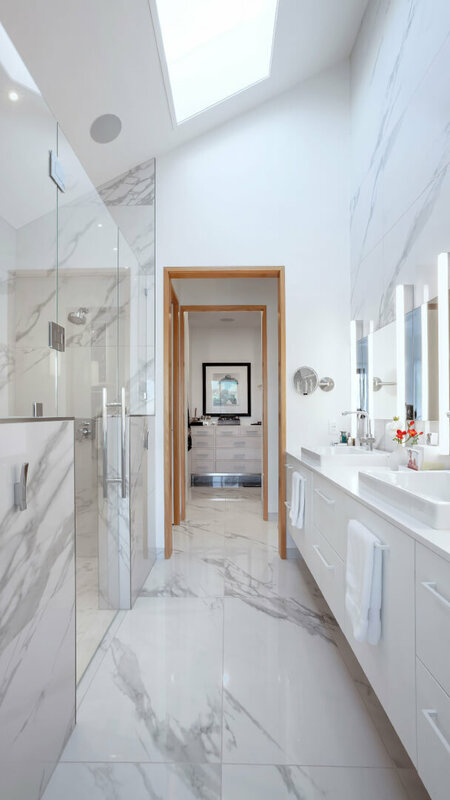 In this case, we helped our client by conceptualizing and clearly communicating a comprehensive design vision inside and out. In effect, this bold design leadership helped give client confidence to proceed forward with community approvals, building permits, and construction. On Thanksgiving weekend, we were able to stop by for a visit to check-out the latest progress Please check out the story here! 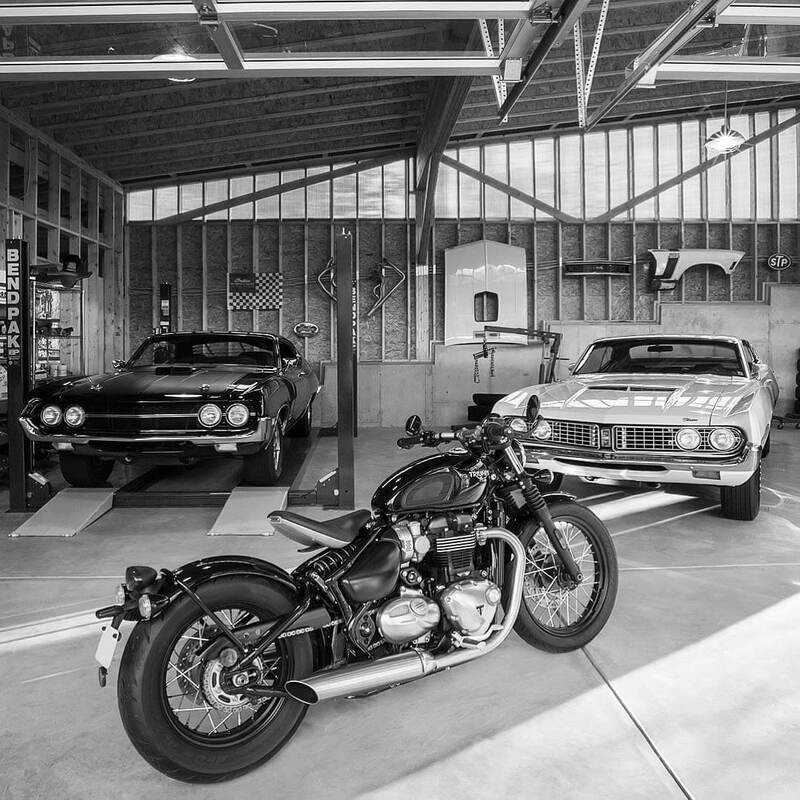 Vintage muscle cars make themselves at home in this new Midcentury Modern auto house completed in the Lakeside Woods Neighborhood within the Traders Point on the northwest side of Indianapolis; one piece of a master plan to comprehensively update a 1950’s Mid-Mod property. 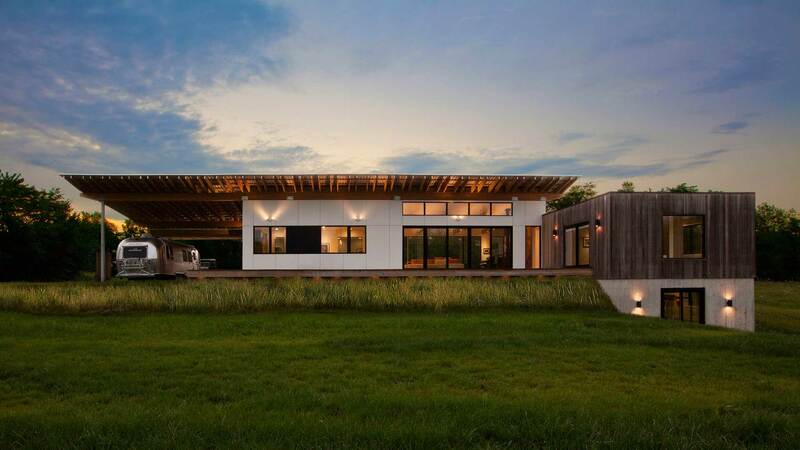 HAUS designed the structure to compliment the original residence in form and style. Chiefly, garage provides abundant natural light for showcasing client collection while doubling as a party barn. The new freestanding structure is what you see from the primary residence elevated open-concept living space, so it’s not just garage, but new property focal point. HAUS featured in HOME-Indianapolis Monthly “Room with a View“. 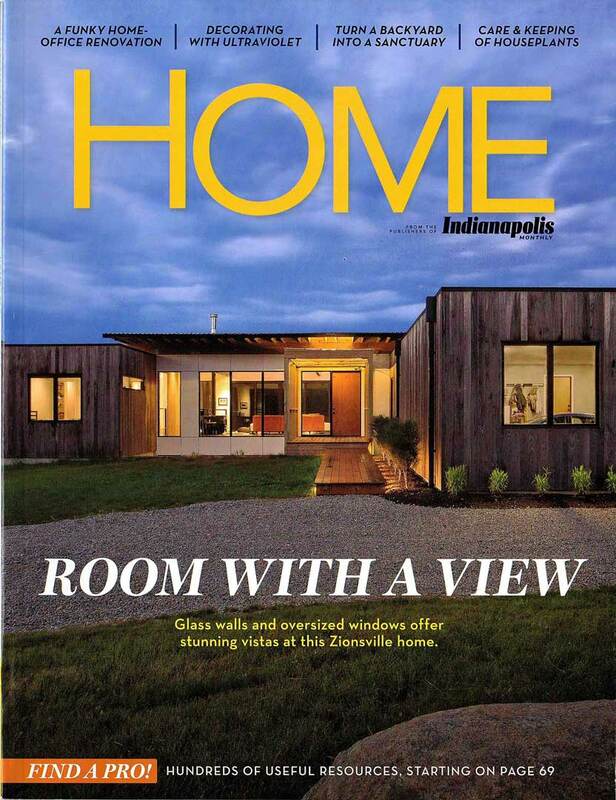 [ON THE COVER] A Zionsville home inspired by nature and travel. Glass walls and oversized windows offer stunning vistas at this Zionsville home. For spacious skies: the highlight of this thoroughly modern home, inspired by cross-country travel and a love of nature, is everything surrounding it. Check out the article by Lori D. Roberts. 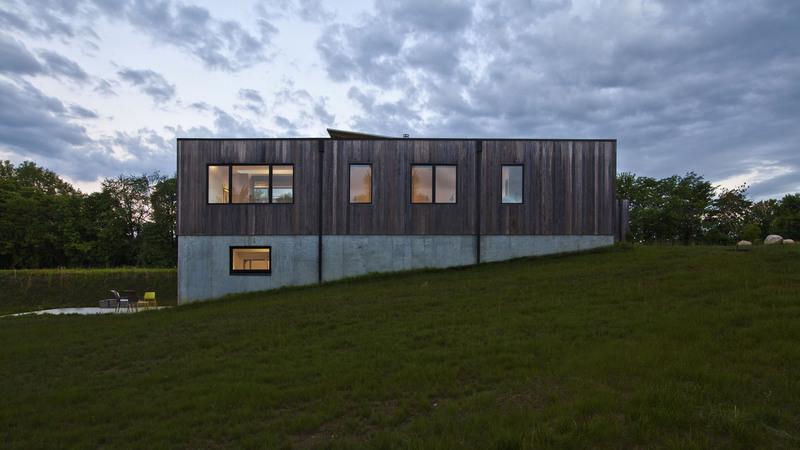 We are happy to report that Copperwood – New Modern House 1 has weathered its first year of occupancy. Our clients for this brand-new design/build project have lived in the home since October 2016 and we are looking forward to being featured on the AIA Indianapolis Home Tour in late September 2017. It’s always great to see old friends and meet new ones at the show, so we hope you’ll stop by for a visit! Check out the project page for the story. Our excellent clients at Treesdale Circle in Carmel are settling-in to their new modern home this summer having been in the home now for a little over a year. 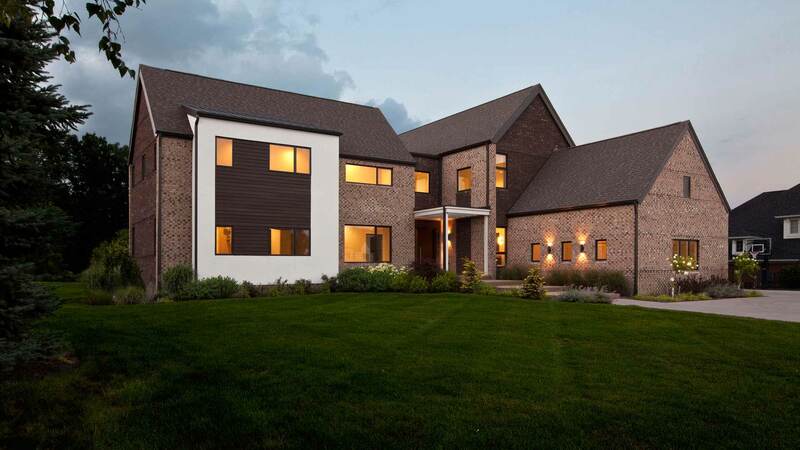 We look forward to showcasing more of this home including future phases down the road, as this project was designed with the long-view in-mind for this young, growing family! This master stair was sculpted from original roof rafters that were salvaged from the roof demolition to create the new master suite at the Classic Irvington Modern Tudor project. This shot is from the top looking down within the modern addition on the back of the home. Stairs are open riser to allow light to pass through the addition north to south. 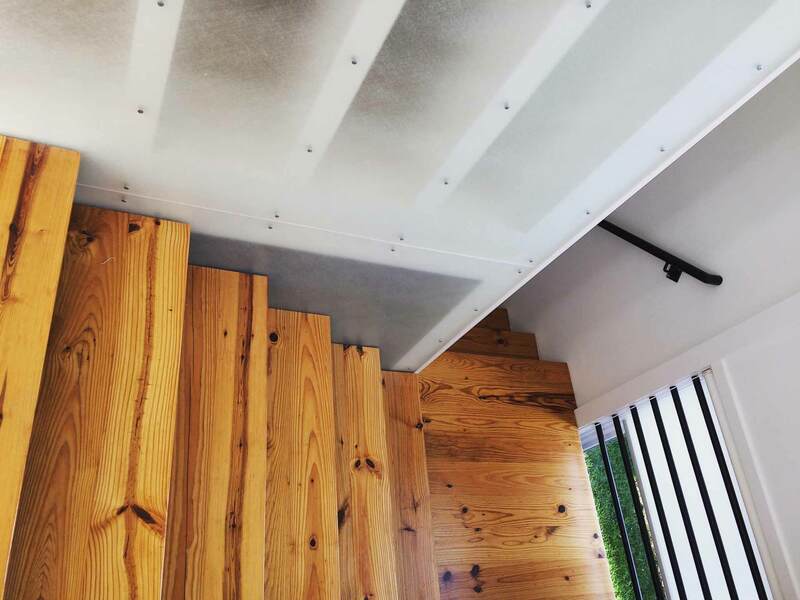 Acrylic guardrail cladding provides safety + diffused light to adjacent spaces. Bars at landing prevent one from tumbling into yard. Simple Modern Bedroom Wing elevates over the landscape at dawn. We are preparing this project for the upcoming home tour this fall, so if you are interested in seeing the project first-hand, please stay-tuned. It sits on 20 acres and is not visible from any public street, so this is the time to experience #copperwood!